As i came back, i’ve visited Paris a little again to see what has changed in a year and used this opportunity to take some picures. And since i’m leaving again in January, at least i’ll have some pics of Paris now. 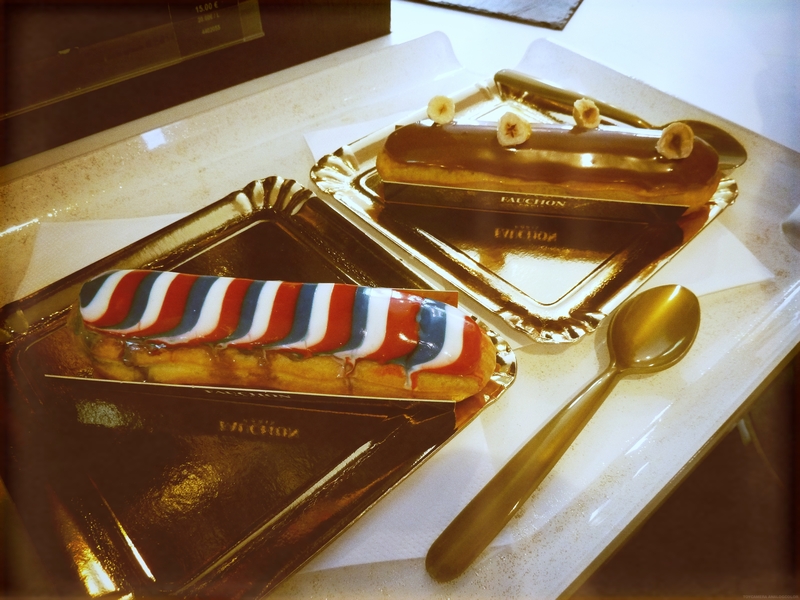 One of my friend and I went to Fauchon, as I wanted to try their éclairs. I chose the 14 juillet (National day in France) with a vanilla cream and strawberries. 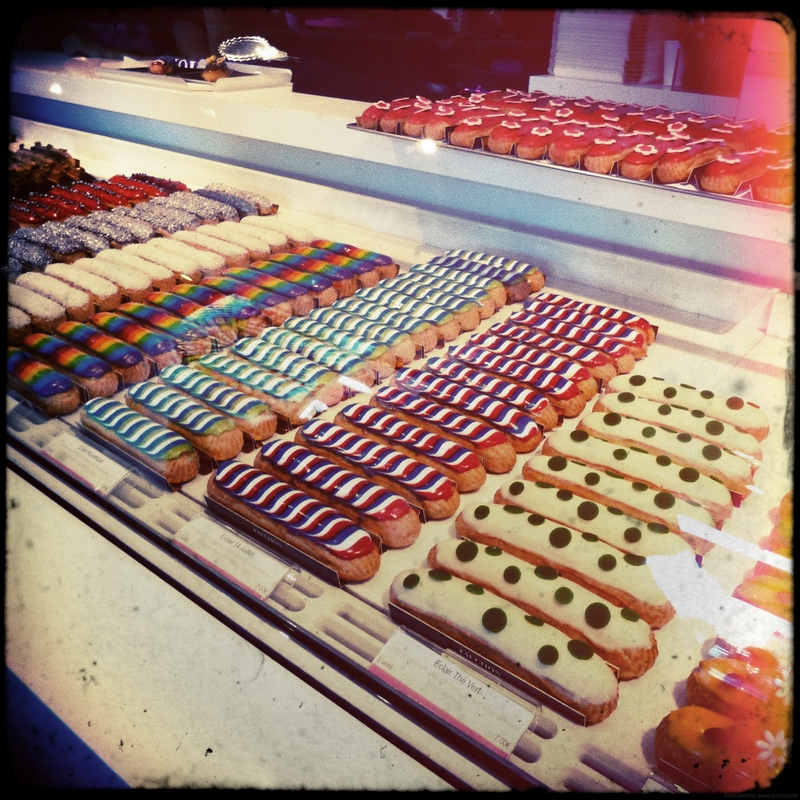 The cream was nice, the puff too, but the colorful cover was too thick and too sweet, which made the éclair too sweet. And for 7€ an éclair, which is overly expensive, that’s pretty bad.My friend tried the praline one. Furthermore the service is the worse i’ve ever seen. I won’t go back there. Because it’s famous, it has a lot of tourists which means they’ll surely not come back again, the sellers are really rude. Nice shop though. A big disappointment. 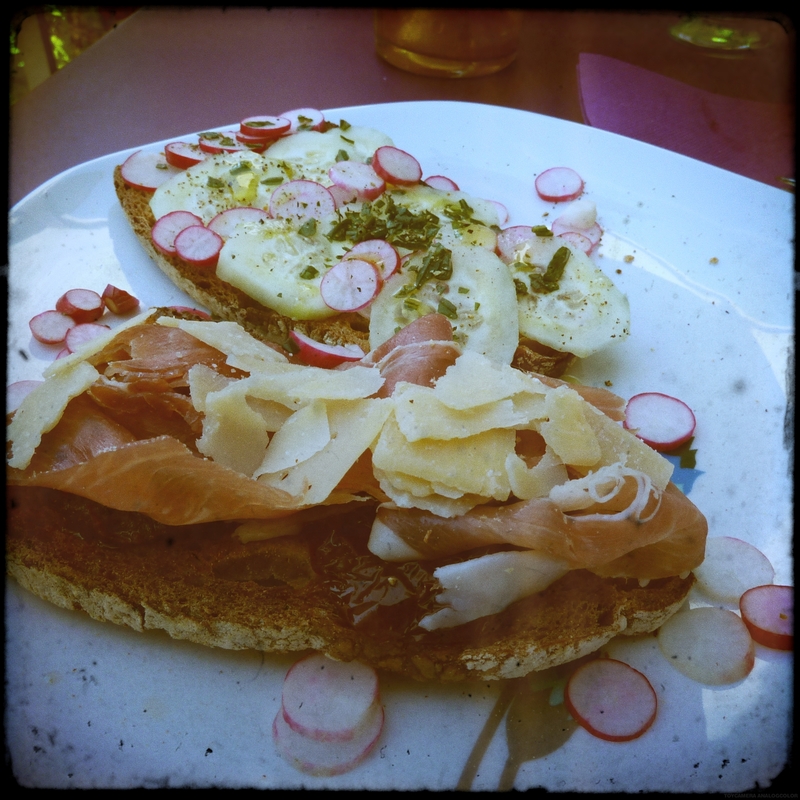 I’m back and already made some trips to the bakeries and tried some new recipes! As it’s still pretty hot in the capital, let’s start with a Carrot Gaspacho! Peel and cut the carrots in really thick slices. Boil then 10mn. Cut the garlic, cook it with the carrots, that you previously cut in thinner slices, and olive oil 5mn in a pan then cover with a lot of water. Add the broth, saffron, cumin, and wait 10mn. Pour everything in a mixer, add salt, pepper, mint and mix the all. Then put in the refrigerator for at least 4 hours. The menu is only in English, so some Taiwanese may have a problem with that (but then if you’re a foreigner that’s perfect for you). I asked for a White Russian: vodka, Kahlua and cream, which is perfect for a coffee and cream lover like me. It’s really nice! Loved it. However i’m not really fond of the place, too dark and the music is too loud. Just like the Yen bar, it’s nice if you want to go to party after or if you’re trying to seduce a girl/boy in the puffy pillows. 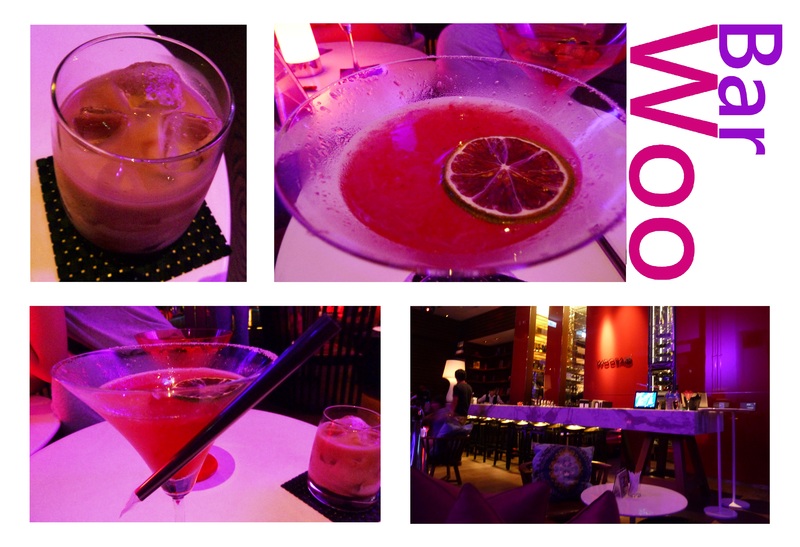 Liked the drinks though. And you have a view on the outdoor swimming pool which is quite nice. A thing also to notice is that even though both W and Le Méridien belong to the same company, their guests are totally different. Le Méridien is more for families, business men and it’s pretty calm, while in W you have a lot more foreigners, young, fashionable, like to show-off and daring people. As a worker i definitely prefer Le Méridien and as a guest…it just depends the event. But for a room, as when i travel i want a quiet place, i would not choose W.
A “吃到飽” (read “Chi dao bao”) or all you can eat restaurant like it doesn’t exist in France. You pay a fixed price, here 549 NTD (roughly 15€) and you eat until…you explode. And obviously in a limited time (2 hours) because otherwise the restaurant would really lose too much money. You have a buffet where you can pick fruits, desserts, ice-creams, and all the meat, seafood and veggies are on a list that you just need you check. All the ingredients are cooked in a broth (for 4/6 people) that you choose. Mala is famous for its spicy broth of course (辣 of 馬辣 means spicy), but as some of us were not too sure about the level of spiciness of the broth, we picked also another one, an all veggies mixed. In Mala; you one have 3 choices concerning the broth: spicy, mixed veggies or cabbage. Once your broth is chosen, you then select all the meat/food you want. You go and pick your sauce. Personally i do like i did in Japan when i was eating sukiyaki: I put my cooked meat in a beaten raw egg. For the seafood, i just mix green onion, chili paste, chili sauce and japanese soy sauce. Now the meat here really has a lot of fat which is quite disappointing. The seafood however is pretty nice, i loved the squids and calamars. Their desserts are awful, it’s some of the worse i’ve ever eaten, but their have a wide range of ice-cream, including Movenpick, my fav, and Haagen dazs. Overall, it’s nice when you are a lot of friends, you can spend a nice time chatting and eating and it’s cheap. It’s also very Taiwanese. But, i advise you to bring medicines because you may be ill in the end, as the food keeps coming. A thin layer of caramel cream, a pear mousse, some poached pears, a little crispy with the pralin and nuts, all this on top of an orange soft biscuit. That’s exactly what is in this dome. I have to say that i love its shape, like Saturna. They gave me this pastry for free and actually i wouldn’t have tried it if they didn’t give it to me. It wasn’t appealing, but i was really surprised by it, and actually i think this is their best entremet. Last but not least pastry before going back to the country of Pastries!